If you’ve ever stopped and admired the gorgeous lawns and landscapes around buildings, homes, golf courses, and more, you’ve probably wondered who is responsible for keeping those areas beautiful, clean, and safe. In short, people employed as landscapers — often called groundskeepers, landscape architects, maintenance workers, and more — are the ones in charge of handling those beautiful landscapes. Landscapers don’t require (by law) too much formal training, education, or certification, but there are plenty of courses, education, training, and certifications that you can participate in to become one of the best landscapers in the business. Interested in becoming a landscaper? 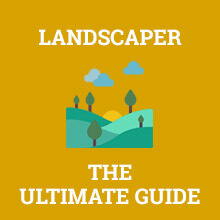 Want to learn more about how to become a landscaper, what sort of education is required to become a landscaper, what landscapers make, and more, read on! What Does a Landscaper Do? Aspiring landscapers do a number of different things, but most importantly, they spend time outside working in a hands-on-way. Landscapers work in both rural and urban areas performing a variety of tasks within landscapes in order to keep them clean, safe, and beautiful. Landscapers must be fit and healthy, as they’ll participate in tasks like planting, weeding, installing landscape features, land gradient alterations, improving draining, laying turf, and improving landscape overall. Some landscapers specialize in architecture, design, and implementation of the landscape. Being a landscaper requires flexible skills, learned technique, experience, and mentorship. While landscaping is a rewarding job, it’s typically not an incredibly high paying job. The median wage for landscapers as of May 2017 was about $14.28 per hour, with the lowest ten percent of landscapers earning about $9.59 per hour. At the high point, earners earned about $20.61 per hour. These numbers, of course, depend on where you work, what kind of landscaping you do, the size of your business, and how many clients you serve. As we mentioned, every state has a different requirement for prospective landscapers. Some states require that you become certified to work with certain pesticides and chemicals and must pass a state board exam. Other forms of landscaping specialties (like landscape design or arboriculture) might require certain licenses or courses. Make sure you know what requirements are necessary before you begin your landscaping journey. After you’ve checked every box on the requirement list, try to explore your career options. Instead of outright finding employment as a landscaper, look into your options for contract landscaping, architecture for landscaping, groundskeeper, nursery managers, grounds supervisors, and more. Don’t settle on a single job before you know what you’re interested in. Try working with a mentor, become an apprentice, or land an internship working with your local landscaping company. If that wont’ work, try to find a company that will provide you with plenty of on-the-job training. This is going to be where you learn the most and what will make you the best landscaper you can be, so ensure that you’re investing time and effort into your training. Try taking courses and exams with The Professional Landcare Network, the Professional Grounds Management Society, and more! How Much Education is Required to Become a Landscaper? For most jobs in landscaping, a formal education is not required. Most of the education you need for a landscapers position will be learned on the job, through certification programs (should you choose to enroll in them), and via a mentor. In most cases, prospective landscapers will likely need a high school degree or a GED equivalent, but this is not always a requirement. Should you choose to pursue a more lucrative landscaping career with special education in horticulture, arboriculture, or landscape design, you might need to complete courses, formal knowledge, and further training. 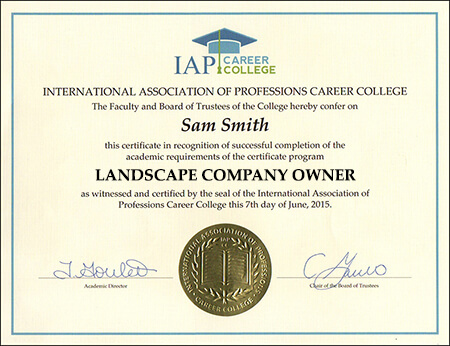 What Certifications or Licenses Do You Need to Be a Landscaper? Education levels and requirements will vary per state to work as a landscaper, and according to the BSL, many states will require that you are licensed and certified if you plan to work with pesticides and chemicals. Typically, you’ll need to pass a test on the safe use of landscaping chemicals. Depending on your employer, you might be required to have a driver’s license. Though it’s not required, you might consider earning voluntary professional certifications from associations like The Professional Grounds Management Society and the Professional Landcare Network. There are typically no certifications required in order to be a landscaper, but if you plan to take professional certification courses, expect to spend 6-10 weeks completing coursework. What is the Job Outlook for Landscapers? The wonderful thing about Landscaping as an industry is that it’s an ever-growing and ever-in-demand occupation. People will continue to need landscape design, landscape architecture, maintenance, and more, and as those needs increase, the demand for people who can do these tasks will increase as well. The BLS projects that between 2016-2026, the landscaping industry will grow by about 11 percent, this is listed as faster than average for all occupations in the United States. That's a higher than average projected growth of 146,300 jobs. Should You Become a Landscaper? Overall, being a landscaper is a rewarding, but challenging, job. The physical demand is quite high, meaning you’ll need to remain healthy and in shape in order to do your job correctly. You’ll also need to be prepared to work in tough climate conditions. The salary is relatively average but the job outlook is quite positive. Overall, the general satisfaction score is rated as medium, but will be a rewarding job for folks who like to be outside, like a challenge, and don’t mind physical labor. Landscapers typically earn hourly wages of about $13, but receive an annual salary of about $27,670 per year. On the high end, landscapers can earn up to $21 per hour, but on the low end, can anticipate making about $9.66. The BSL reports that the landscaping industry is set to grow faster than most occupation in the United States. By 2026, the job outlook will likely grow by 11 percent for landscapers. There is usually no formal education requirement for the landscaping industry, however, for specializations, you might need to take courses, earn certification, or earn formal education. Q. How Much Can You Make with a Landscaping Business? Typically, landscapers make about $28,000 annually with hourly rates of about $13.51 on average. Q. What Do You Do as a Landscaper? As a landscaper, you will be expected to work outside in all climate conditions to care for, manage, and design outdoor spaces. You will likely work with heavy machinery, chemicals, and sharp objects. Typically, you will weed, mow, water, build, fertilize, do seasonal clean up, and a myriad of other things. Q. How Many Hours a Day Does a Landscaper Work? Landscapers can typically count on working long hours, meaning, if the sun is up, they’re likely outside working. Q. How Much Does a Landscaper Make an Hour? On average, landscapers make about $13 per hour. Q. Do You Have to Have a Degree to be a Landscaper? No. In most cases you do not need a degree. If you are looking to specialize in horticulture or arboriculture, you might need a degree. Q. What Skills Do You Need to Have to be a Landscaper? I am very grateful for this free resource provided here. It has really made me see this is a better light and now I am sure I can do this. Honestly, I admire landscapers when I see them working on the lawns and I’ve always wanted something like that. Good thing I have this to put me through. Just when I thought landscaping is an easy job, I stumble across this material. Now I don’t know how to begin. Practice Tests: Get Ready for Your Exams! How to Become: Get a Career, FAST!